All photos and text by Elizabeth Coxon (now Omodt). Thank you for sharing your experience, Liz! This whole thing started in a Campbell coffee shop in late December 2016. My Fiancé gave me A Running Coach for Christmas, and on that day I sat across from Coach Aleks and talked about how I wanted a successful Quicksilver 100K finish as my first Western States Qualifier. In my heart I am an Ultrarunner. However... I was also registered for the Santa Rosa Marathon, and I asked if it was possible for a Western States and a Boston Qualifier to live in the same year, in the same body. Aleks said it was possible. That's all I needed to hear. After I crushed QS100K with a sub 15 hour finish, it was time to train for a BQ. Coach said she was training another runner to qualify at Santa Rosa, so I was going to have a new friend to run with. side by side all the way up to the Starting Line for Santa Rosa. We both qualified in miserable heat conditions. It was a devastating situation from all angles, but Coach Aleks masterminded a plan to get all three of us to Boston in 2019. Coach qualified first at CIM, Nadine came back with a vengeance and crushed NVM with a BQ minus 10:35, and I was the last part of this three-piece puzzle. I had to qualify for Boston, at Boston. Coach Aleks put together a bulletproof training plan for Boston, I was excited that I would get to run every day, but the workouts were faster and tougher, which was exactly what I needed to be to get it done. Since Monday, several people have asked me about my mental game during the race, how I managed to stay in it given the bad weather conditions. The best way I can describe it is that I stacked up a list of facts that I kept replaying through my brain as I ran and fought to maintain my 8:08 pace. First of all, ultimately I always have a choice of what kind of day I'm going have. 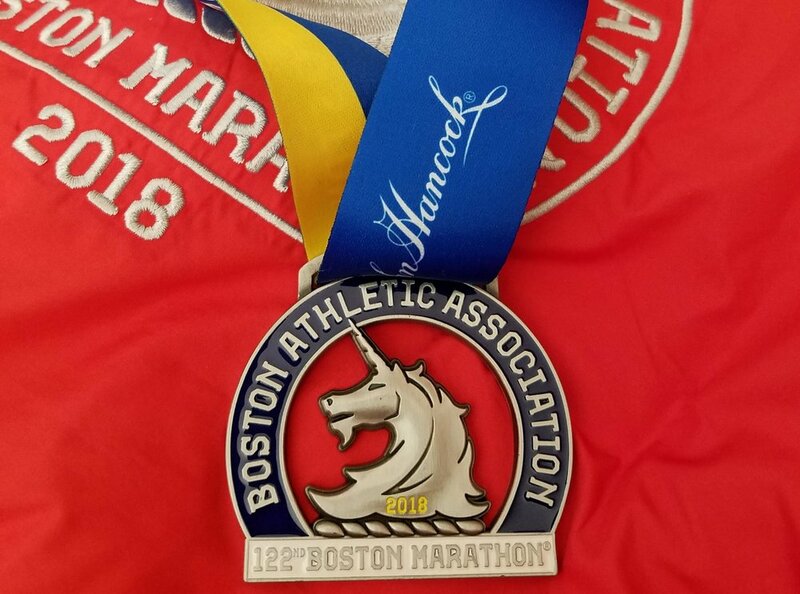 I didn't want to walk away from my first Boston Marathon experience feeling like it sucked, so I didn't. I walked away knowing it was awesome. Then, the first 10 miles are pretty easy and they went by super fast. In Ultra Running, having 16 miles to go is no big deal, so I pulled out memories from those moments in Ultra training. Also, Coach Aleks reminded me that there are tons of runners that will never get to see a Boston Marathon, and lots of people that wanted to go but didn't make it. I owed it to them, to the course, and to myself to give it my very best, so I did. Then, there was no way I could bear the disappointment of not getting to go to Boston in 2019 with Coach and Nadine. I never, ever, want to miss out on a good time! And, not to mention that not only was Coach not a fan of my BQ Plan B, but it was a flat gravel marathon in 80 degree weather. No thanks! Better to just get it done there in Boston, so I did. I was extraordinarily well-trained for Boston, I can't thank Coach Aleks enough for pushing me to my limit with that bulletproof training plan. The weather wasn't perfect, but worrying and whining about it wasn't going to change anything. I went out there and gave it my all, putting one foot in front of the other like always. Get ready Boston 2019...The Trifecta is coming! !